Queen’s lead guitarist Brian May recently confirmed the band’s plans to release a new album by the end of the year that will contain previously unheard tracks sung by the band’s iconic and now deceased frontman Freddie Mercury. The album’s rumored title is Queen Forever. The unreleased songs date back to the 1980s and feature Mercury's vocals over recently recorded instrumental tracks, which will be merged together using ProTools. May discussed what the album will sound like, explaining: "It is quite emotional. It is the big, big ballads and the big, big epic sound." The Queen guitarist disclosed that he is restoring the songs himself along with bandmate Roger Taylor. May has previously revealed that Mercury's unreleased material includes a 1983 collaboration with Michael Jackson… it is unclear if the song will appear on Queen Forever. 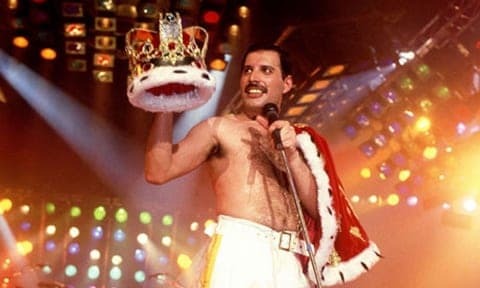 Mercury died at age 45 from bronchial pneumonia resulting from AIDS, just one day after he publicly announced he had the disease. Queen will kick off their 17-date summer tour in Chicago on June 19; openly gay singer Adam Lambert will sing in Mercury’s place.